Caps lock intentional, this Wrangler gets a carbon fiber hood, ‘high-clearance’ carbon fiber arches and rear tub, and perforated aluminum panels. 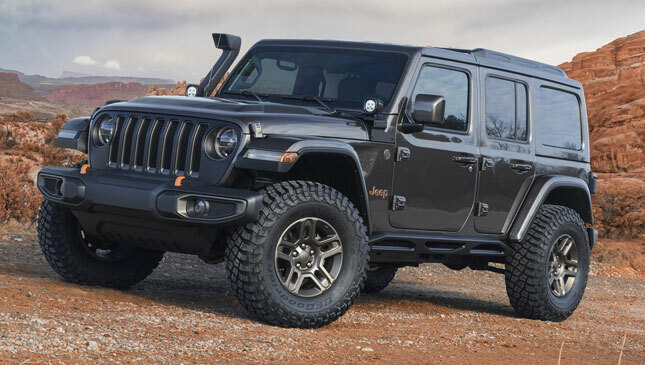 Lightweight is the key here, and it’s lost so much weight it actually sits two inches higher than a regular Wrangler. It’s also 22 inches shorter for better approach and departure angles. Basically, lighter and fightier. Underneath sits a 2.0-liter turbo four-pot, with an eight-speed automatic gearbox. To use Jeep’s parlance, the Sandstorm concept is “all about blitzing long, sandy straightaways while still being capable of handling the daily driving duties.” TG’s ideal car, then. So, it gets a Baja-inspired look, with a carbon hood, vented arches, tube bumpers all round, modified rock rails, on-board air compressor, racing fuel filler, and auxiliary lights. It gets heavy duty four-link suspension up front, a trailing arm four-link at the back, a slightly longer wheelbase, plus custom suspension that allows 14-inch of wheel travel on the front, and 18-inch travel at the back. Also, a V8 happens. A big fat 6.4-liter V8 from the Mopar performance catalogue. Good. 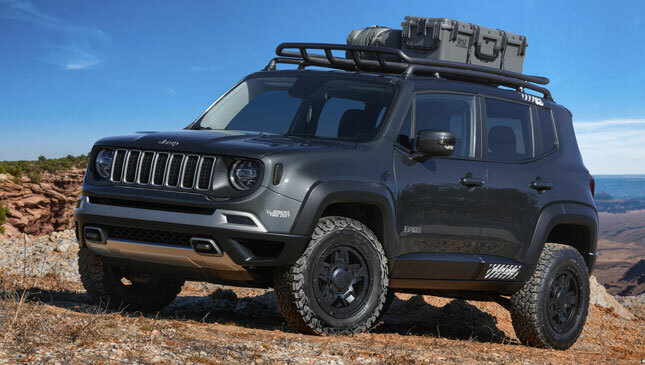 This one’s a parts special, a Renegade that’s showcasing some exterior refinements, a 1.5-inch lift kit, roof rack and rock rails. There are 17-inch wheels, custom trimmed seats, carbonite finishing on the gear shift, speaker and vent surrounds, and Mopar mats. Also, there’s a Tigershark. Specifically, a Tigershark 2.4-liter engine matched to a nine-speed auto. Time for a classic. And everyone loves a classic Jeep. This one’s been stretched by five inches, with an updated--though still steel--body to match, a wider track, reinforced frame, and custom arches. 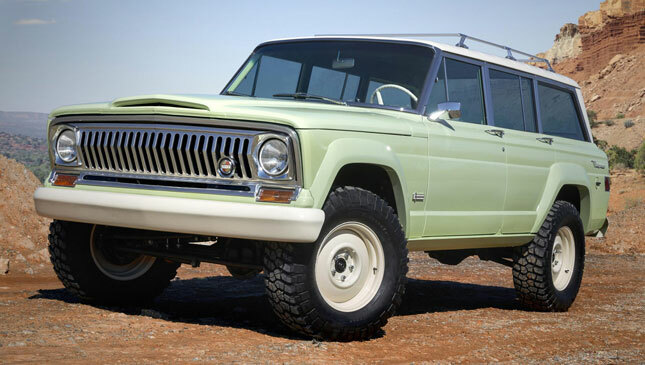 The wheel wells too have been reshaped, while the Wagoneer also features a new grille, 17-inch steel wheels, coilovers and much leather trimming inside. 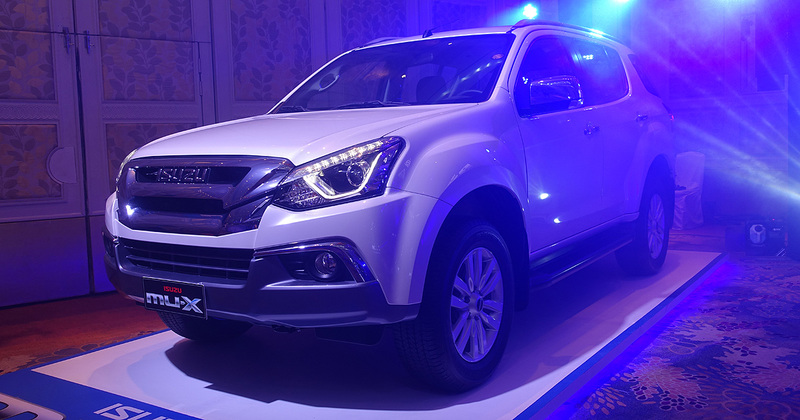 Also it’s got a whopping 5.7-liter V8 with a four-speed--four!--auto ‘box. Lovely. Sorry, now that we’ve got that out of the way, the fully loaded (again, sorry) Jeep is basically a car-based catalogue of Things. 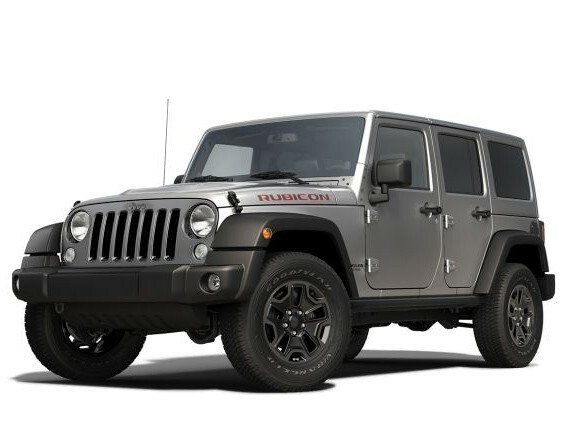 Things like a new hood designed to accept a cold-air intake, new grille, bumper, winch, LED lights, a 2-inch lift kit, 2.5-inch aluminum shocks, oversized tires, and other such things. Oh, and a yellow color called Nacho yellow. Yeah, not sure about that last bit. Clearly the middle part of a Jeep trilogy (Jeep, Jeep Jeepster, Jeep, um, Jeepsterest? 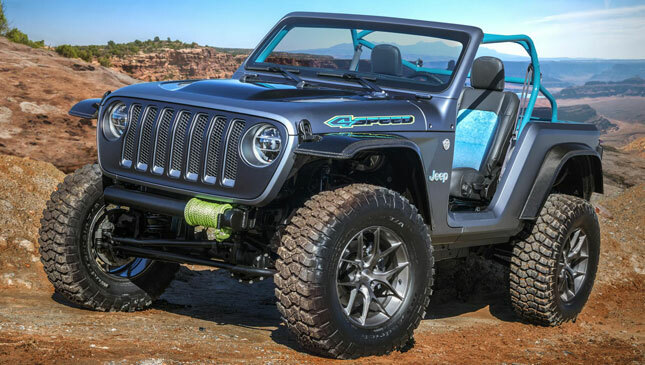 ), this Wrangler Rubicon concept gets the color and style of the 1966 Jeepster. 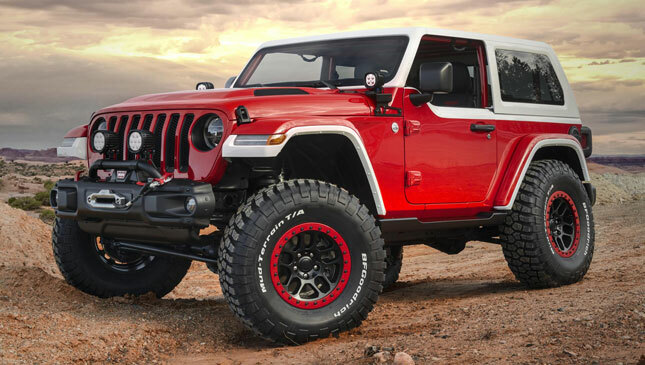 So there’s a red and white paint job, a raked windscreen, which you can fold down of course, a new hood (and optional snorkel), LED off-road lighting, a two-inch lift kit, 2.5-inch aluminum shocks, and a full roll cage. Not a Japanese-market special, but again, another parts special. New hood. Optional snorkel. New 5-inch LED lights, for ‘military grade illumination,’ which is probably overkill for a Wednesday night shopping run. Wheels are of the 17-inch variety, finished in something called ‘Brass Monkey,’ which we’re too afraid to ask more questions on. 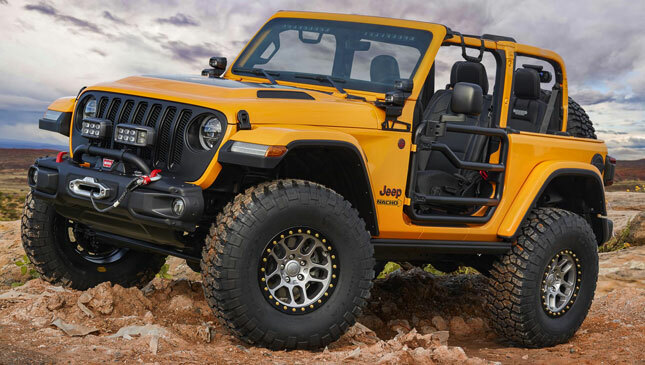 They’ll be on display at the Easter Jeep Safari in Moab, Utah, between 24 March and 1 April. Choose your favorite. Now.